1. Preheat the oven to 200oC, gas mark 6. Place one fillet skin side down on a small baking tray. Beat the honey, ginger, lemon zest and seasoning into half the butter and spread on top of the fillet on the tray. 2. Place the other fillet on top (skin side up) to form a sandwich. Sprinkle the top with the lemon juice. Roast in the oven for 40-45 minutes until the fish is cooked through and the flesh flakes easily. 3. 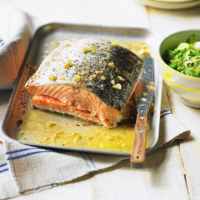 Towards the end of the salmon's cooking time, melt the remaining butter in a shallow pan and add the salad onions. Cook for 2-3 minutes until soft but not browned, then add the lettuce, peas, some seasoning and 100ml water. Simmer, fast, for 4-5 minutes until the peas have softened and the liquid has almost evaporated. Serve with the salmon and some Jersey Royal potatoes.